Closed for the season see you in May 2019! If you're interested in joining the team at La Vida Hospitality please fill out a job application by clicking the button below. For wedding and event information please click the Event Tent & Weddings button and use the contact button under that section. Currently we DO NOT accept reservations, you can call ahead or use the "No Wait" mobile phone app to get yourself on the list ahead of time. You can download the app by clicking here. For all other inquiries please use the contact box below. A member of our management team will reach out to you as soon as possible. For immediate concerns that do not pertain to employment or bookings you can reach out to our office number at (302)402-5300. The Big Chill Beach Club is located within The Delaware Seashore State Park in The Southside Inlet Parking. Park admission fees do apply to those visiting both the state park & The Big Chill Beach Club. 2018 Daily Parking Fees: In-State $5, Out-of-State $10. Full service cocktails, wine, beer. 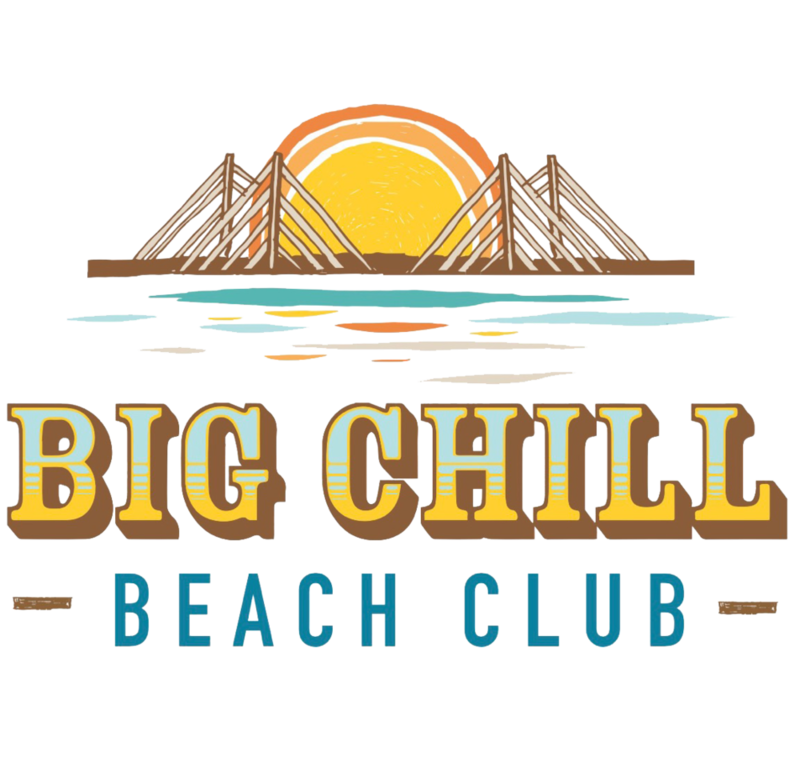 What exactly is Big Chill Beach Club? In addition, Big Chill Beach Club will offer a full bar offering great cocktails, beers, and wines. Some additional features will include an octagonal bar under our 36’ Umbrella, large table dining, and a fire pit & seating area in the sand. An additional amenity for our guests to host special events. The tented facility is designed to take advantage of the sweeping water views of the Atlantic Ocean, the Indian River Inlet & Bay, as well as the dramatic suspension bridge bathed in nighttime cobalt blue lighting. The newly constructed tented setting is ideal for wedding receptions, anniversary and birthday parties, as well as company get togethers for up to 200 people. The Event Tent can also accommodate sit-down dinners for up to 160 guests. This new venue is a public and private partnership between DE State Parks and La Vida Hospitality Group. The goal of the partnership is to enhance the beach experience at the Delaware Seashore State Park. What do you mean by “partnership” ? Quite simply, DE State Parks and La Vida Hospitality are working together to add an amenity to one of it’s parks to improve the overall park experience while being mindful of the pristine beauty of the DE Seashore State Park. Who is La Vida Hospitality Group? La Vida Hospitality Group is a hospitality & entertainment management company located in Rehoboth Beach, DE. They bring a wealth of experience in food, beverage and events business management-- particularly within the Delmarva region. La Vida’s prowess in this dynamic industry translates to quality, affordable food & beverages and fun experiences with superior guest comfort. Our management of venues include the award- winning Fork+Flask at Nage restaurant in Rehoboth Beach, Crooked Hammock Brewery, Restaurant & Backyard Beer Garden in Lewes, DE. Big Chill Surf Cantina and Taco Reho food truck in Rehoboth Beach. Is this a first “partnership” for the State Parks? “We are constantly looking for ways for parks and businesses to partner,” says DNREC Sec. Shawn Gavin. Just last year, La Vida Hospitality was the co-presenting sponsor of the Winter WonderFEST event staged at Cape Henlopen State Park. The nonprofit event raised over $100,000 for Sussex Co.charities, bringing thousands of visitors to the state park and Lewes Ferry Terminal grounds in an otherwise quite, off-season winter. Where is Big Chill Beach Club located? You can’t miss it! It’s constructed atop the existing concession stand at the south side foot of the suspension bridge on Coastal Highway. It’s the South Side Inlet on the Indian River Inlet-- the ocean side at 27099 Coastal Highway, Bethany, DE 19930. Were just minutes from Lewes, Rehoboth Beach, Dewey, and of course Bethany Beach just down the road. And now all the inland folks will be pleased with Big Chill Beach Club being so close to their homes. There’s plenty! Existing state park pass owners will, of course, be able to enter and park free at the existing parking lot. Applicable State Park fees do apply for parking and are on a first come first serve basis. When will Big Chill Beach Club be open? June 2nd is the projected opening. All throughout the summer Big Chill Beach Club will be open initially for lunch and dinner from 11 am ‘til 10pm. We will be adding breakfast offerings in our concession stand from 8 am to 11 am starting in early June. The Beach Club dining facility, and the adjacent Event Tent, are specifically designed to take advantage of Southern Delaware’s seasonal outdoor climate, including its spectacular sunrises and sunsets. Visitors can expect to enjoy our beach-themed menu, cocktails, outdoor fire pit, and warm hospitality through October. What’s so unique about the actual facility? -- Second story decks that allow for an open air outdoor dining deck with 360-degree waterfront views of the Atlantic Ocean, Indian River Inlet and Indian River Bay. Seating for up to 200 guests to enjoy dining and cocktail service. -- a $300,000 high tech adjustable umbrella “room” for rooftop dining. The umbrella, which is manufactured in Austria, is designed for guest comfort and protection against rain and wind up to 100mph. The glass-enclosed walls allow for 360-degree views of Mother Nature’s spectacular landscape despite any rain and wind she may have in store. --a new panoramic perspective of the park’s impressive suspension bridge which is bathed in dramatic cobalt blue nighttime lighting. an upgraded kitchen facility to provide quality, affordable food and beverage service available to the public. --an outdoor fire pit and a sand pit hang-out area for family and friends to fully enjoy the outdoor pleasures of Delmarva’s treasured summer season. Sun-worshipers may now extend their day at the beach by taking advantage of Big Chill Beach Club’s fun family amenities. What about the Event Tent? It’s already a hit with couples placing their reservations for their upcoming wedding receptions! This covered pavilion offers similar waterfront views as the Beach Club deck, dramatic night lighting of the bridge, and plenty of space for up to 200 party-goers on the dance floor. The tent can also serve up to 160 sit-down dinner guests. The newly-constructed Event Tent and the Big Chill Beach Club are connected by an elevated “beach promenade”-- a great place to soak in the unique environment. How about the restaurant’s food & beverages? -- Boardwalk favorites such as Burgers, dogs and crinkle cut fries. It’s beach fare that’s made to enjoy on the deck... or on the beach. Yes, that’s right, a portion of the menu will continue to be available through the concession stand underneath for beachgoers who want to get on the beach. Crafted cocktails, wine and beer will quench your thirst while you relax on the Big Chill Beach Club’s deck. Drinks will only be available at the Big Chill Beach Club areas , so don’t even think about taking them down to the beach! Is the menu the same type of food for the Event Tent? The food and beverages can be whatever the event host wants it to be. Whether it’s a wedding with all the bells and whistles, or party that’s laid back and casual, the Big Chill Event Tent catering team has plenty of ideas to help you plan the gathering to meet your expectations. Birthdays, anniversary parties, company get-togethers-- our experienced team can help with all the details. From elegant, oceanfront sit down meals to a casual taco bar, we have countless food and beverage options to make the event as unique as you like. -- On premise ceremony location (offered at an additional cost). -- Sit down dinners & weddings for up to 160 people. -- Cocktail parties for up to 200 people. -- Full service customized catering. Our goal is to make the host feel like a guest at their party so they can enjoy the moment at this spectacular new venue! So Big Chill Beach Club is different than the famous Big Chill Cantina in Rehoboth? Same vibe, but different set up. Long time fans of Big Chill Cantina in Rehoboth Beach call it the “Locals’ Go-To Spot” for celebrating the the good life at the beach. Fun cocktails and popular brews for guests who are 21+. Big Chill Beach Club embraces the same beach-lovin’ spirit for people of any age.A place where you can brush off the sand, grab a seat and have a bite. An oceanfront oasis where anyone can slow down, chill out and make memories with family and friends.